Herban Planet, LLC Jun 27, 2017 Journaling is a simple activity that needn’t take up more than five to 10 minutes a day. Someone who uses cannabis might find a weed diary helpful in figuring out their most effective strain, their favorite method of ingestion & the correct dosage. Journaling is a simple activity that needn’t take up more than five to 10 minutes of the day. It improves mental health, helps us set and reach goals, and can serve as a useful record of our daily lives. By keeping a daily journaling, we learn about ourselves, our motivations, and our relationships; we can see where we are progressing in life and where to make changes. There are also are many specific types of diaries we may choose to keep. For a globetrotter, a travel journal might be necessary to remember the location of that hole-in-the-wall ramen shop in Sydney. An amateur triathlete might make use of an exercise diary to chart their workout progress. And someone who uses cannabis might find a weed diary helpful in figuring out their most effective strain, their favorite method of ingestion and the correct dosage. Whether you use cannabis recreationally or medicinally, a journal can be beneficial in multiple ways. It will make you aware of your smoking habits and give you a break down of how much you’re consuming throughout the day or week. For those of us who tend to avoid adding up how much money we spend on weed, a diary can be a friendly, non-intimidating budgeting tool. 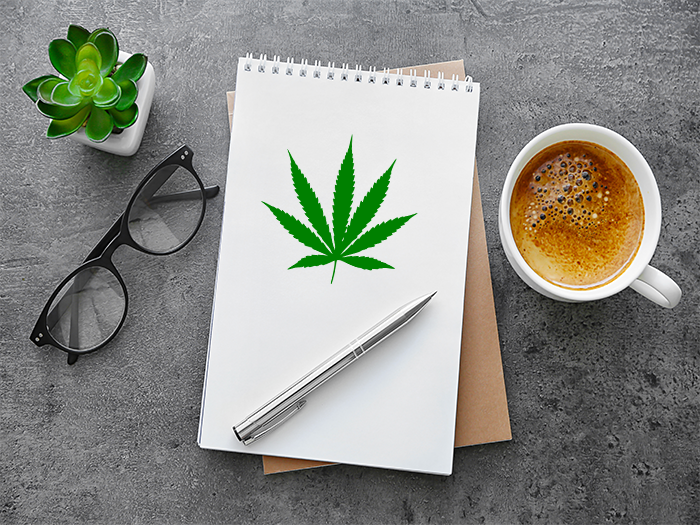 Anyone using marijuana medicinally can use a journal to make note of their symptoms before and after using weed, the strain they took, and how much was needed to relieve them. It’s an insightful, fun way to learn about yourself and what motivates you to use pot. - Goldleaf makes a sleek and classy patient journal that includes an introduction, cannabinoid guide, and terpene guide. The entry guided pages include check boxes, fill-in-the-blanks, and charts, as well as a section for general notes. They also make log books for growers and tasteful wall-art. - The Chronnoisseur creates products for the cannabis sommelier. This includes a diary for reviewing different strains. Use it to keep track of where you found each strain and how much it cost. There is also a space to describe the smell and taste of the cannabis, encouraging you to really savor and experience what you’re smoking. - Green: A Marijuana Journal was created by Dan Michaels, author of Green: A Field Guide to Marijuana. The journal is self-explanatory and easy-to-use and features a glossary, basic primer, some lists of suggestions, and a flavor palette. This journal asks you to make note of if you were with company, so you’ll also have a nice little record of all your smoke sessions with friends. Keeping a cannabis journal is a healthy, fun, and observant experience. It’s not time consuming and it will help you figure out what your favorite strains really are. Unlike most personal diaries, you might even want to leave it out for your friends to flip through and learn. If you can take five minutes out of your day to roll a joint, you can take another five to journal about it. You’ll find it’s well worth your time.